Profane started out in September 1992. The band already exists since 1989, but it started seriously in 1992. Original members Ed, Jacco and Misha were joined by Marco and started working on serious material. Wolter joined almost immediately, after this. The first demo was created in the spring of 1993 and entitled: Sorrow. Sorrow consisted of four, mainly doomy tracks and started the beginning of a lot of international contacts with labels, zines and people who liked the music. Between 1993 and 1994, Micha joined Ceremony (R.I.P.) and left the band. He was replaced by Marco's brother Johan. The line-up hasn't changed since this last replacement. In the spring of 1994 our second demo; Requiem was released and the reviews and reactions were even better than they were on Sorrow. 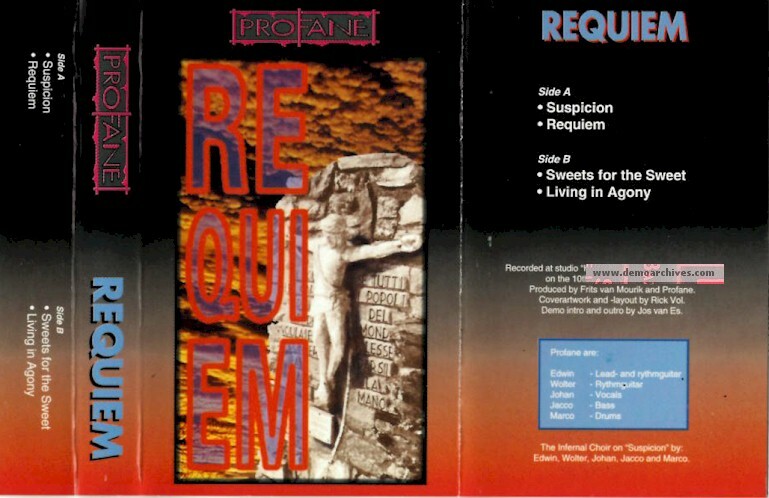 Requiem showed, that Profane was no longer a doom-metal band, but had made a switch to death-metal. Pro printed covers. Pro printed tapes.